This is a typical "brain-storming" session at our house. Ladies, it’s late at night when I’m writing this, and I have simply got to get to bed. My eyes are heavy… I’m falling asleep… Seriously, I’m breaking my be-in-bed-by-ten-o’clock rule. 🙂 I didn’t have time to finish this blog post as I wanted to, but I’ll give you what I’ve got so far. In addition, over the past few weeks I’ve been writing down scriptural references to educating our children. My husband’s sermons, books I’ve been reading, discussions in the car, and even my private Bible reading have all contributed to an ever-growing list. Tonight, my husband listed several elements of a biblical education, and then we took our list of Bible verses and compared the two. I thought you’d enjoy listening in on our conversation, even though this conversation will have to continue in the coming weeks. I believe a biblical education has the teacher at the front, basically the old lecture style, with the teacher facing the students and the students facing forward. It is based upon an understanding that the teacher will teach something and will share examples, and then the students are supposed to work on things. As they have problems, they ask the teacher if they have a concern. The teacher can teach more examples to help the students learn, but the students themselves are supposed to work independently based upon what they are learning in class. My husband used to be a teacher, so that’s the picture he has in his mind. It looks a little different in a home-education environment. But the Bible agrees that the parent-teacher is the one who holds wisdom and needs to impart it to the child-student. “Is not wisdom found among the aged? Does not long life bring understanding?” (Job 12:12). “These words that I command you today shall be on your heart. You shall teach them diligently to your children, and shall talk of them when you sit in your house, and when you walk by the way, and when you lie down, and when you rise” (Deuteronomy 6:6-7, ESV). Listen, my son, to your father’s instruction and do not forsake your mother’s teaching” (Proverbs 1:1-8). Foundations and fundamentals that have to be learned in order to be able to think at a higher level in the future. It’s based upon memorization. They need to learn these foundations and fundamentals in order to think correctly. As children, they can think — but they cannot think correctly. “Whom shall he teach knowledge? and whom shall he make to understand doctrine? them that are weaned from the milk, and drawn from the breasts. For precept must be upon precept, precept upon precept; line upon line, line upon line; here a little, and there a little” (Isaiah 28:9-10, KJV). but a wise man listens to advice” (Proverbs 12:15). and clever in their own sight” (Isaiah 5:21). Then as they continue on into junior high, then they begin to understand things like application, where they can take something that has been taught to them and be able to know how to apply it to a life situation. They learn to take the principles and the foundations they have learned and use them, in math or language arts skills, to be able to read and write better, to begin to understand how to put papers together from paragraphs, equations from math problems (addition and multiplication, etc. ), and to be able to use the things they know how to do in math to be able to go on to real-life situations, through word problems and figuring things out. And then as they continue on into high school and once they learn the application process, it comes into synthesis and evaluation, where they can then begin to apply the principles, not only to papers but to begin to study and apply it to opinions, not just regurgitate the information but to have opinions and to be able to defend those opinions and to be able share those opinions and apply them to their lives and how those principles apply to what they’ve been learning and to be able to make choices in those matters. If you do not have the lower, foundational skills, then you cannot correctly – and there is a correct way – do the higher-level thinking skills. You can do thinking, but you can’t do higher-level thinking, because you don’t have the basics. It’d be like taking a four year old and then going out and telling him how to have a budget when he has no idea how to do basic math skills, no idea how to deal with word problems. If he doesn’t know how to do those two foundational skills, how can he develop a budget and live by a budget? He has never done the basics first and the application process next, to be able to evaluate a budget for himself. And so what has happened in many kids today is that many are without any foundational skills, and there are huge holes. It’s like taking Swiss cheese and trying to fill it with milk. It’s an impossibility because the milk flows out all the holes. There’s a lot of cheese there, yes, that can hold milk, but there are still holes, and so therefore the milk flows out. And that’s what’s happening. These kids are coming up into adulthood and are not capable of having all the skills necessary because they have not mastered the foundational skills. Because they can apply it to some aspects of their lives, because they have part of the skills, everybody says, “You just keep going and go out into the world and have fun.” It ends up backfiring with many of them. And there you have it, in rough Kraig-and-Anne discussion, without worry about correct grammar and writing style. Just a conversation between husband and wife, with lots of note taking and discussion that you didn’t get to hear. So sorry! It was fun! I like what your husband said! If I remember the stages of learning described in the classical method, his suggestions seem to go along with that style. I have been interested in the classical method, but am always given pause by the non-christian nature of many of the materials it’s advocates use. I’ve just recently finished reading Charlotte Mason’s final book in her homeschooling series and although she says many things that make sense as far as creating a rich learning environment for children, I find her insistence that children lead and and parents and teachers step back to be troubling. Sometimes it seems to me that she is implying that we do a grievous injury to them to try to lead them and shape their characters and intellects. Hmmm, this does not seem Biblical to me. I think I’m going to look around and see if I can find any materials on classical education that don’t involve heavy usage of the typical Western literary canon. Thanks for sharing your conversation with your husband. Have a blessed weekend. Christine (the author) is now a friend of mine, and I highly respect her! Good stuff here. This is all so true! Thank you for sharing! Anne, I know this may sound strange… LOL! If you knew “us,” you would laugh. 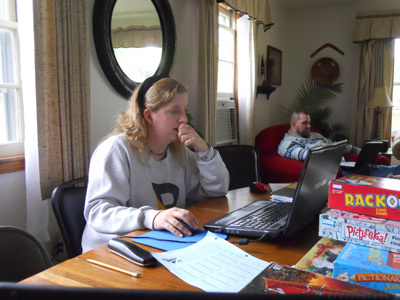 Thankyou so much for your picture of “brainstorming.” I have always wondered what other homeschooling couples look like. I mean just the day to day little living picture. You, as a couple look just like us! I sit at my desktop computer and sometimes wish for a laptop.. but my hubby has a laptop and he sits either at my desk or on the sofa near by. Now, I know we look like other homeschooling parents! It’s just a fun thought for me today. I needed that.